Tengu and a Buddhist monk, by Kawanabe Kyōsai. The tengu wears the cap and pom-pommed sash of a follower of Shugendō. Tengu (天狗, Tengu "heavenly dogs") are a class of supernatural creatures found in Japanese folklore, art, theater, literature and religious mythology. They are one of the best known classes of yōkai (monster-spirits), though this classification does not prevent their occasional worship as Shinto kami (revered spirits or gods). Although the term tengu was derived from the Chinese designation for a type of dog-like demons (天狗 (tian gou)), the Japanese spirits were originally thought to take the forms of birds of prey, such that they are traditionally depicted with both human and avian characteristics. In the earliest sources, tengu were actually pictured with beaks, but, in later depictions, these features have often been anthropomorphized into unnaturally long noses. In the modern imagination (and especially in artistic works), this single characteristic (the expansive proboscis) is the most definitive aspect of the tengu. Though the term used to describe these beings is of Chinese origin, their particular characterization is distinctively Japanese. Indeed, the precise origin of these crafty (oftentimes dangerous) bird-men is unknown, implying that the understanding of them developed through a process of importing myths from China (and, indirectly, from India), and then localizing them through overt syncretism and reinterpretations in popular folklore (see below). In this context, Japanese Buddhists long held that the tengu were disruptive demons and harbingers of war (much like their Chinese prototypes). In their malevolent and disruptive behaviors, the tengu shared similarities with European goblins. Over time, this overtly negative evaluation was softened somewhat, as the Buddhists came to acknowledge the popular conception of these spirits as morally-ambivalent protectors of the mountains and forests, who were as likely to bring windfalls as calamities to humans intruding upon their domains. The tengu, due to their professed affinity with the natural world, are associated with the ascetic practices known as Shugendō (a path of nature-based mysticism), and, in the visual arts, are often depicted in the distinctive garb of its followers, the yamabushi. Kobayakawa Takakage debating with the tengu of mount Hiko, by Tsukioka Yoshitoshi. The tengu's nose protrudes just enough to differentiate him from an ordinary yamabushi. In Japanese art, the tengu is portrayed in a wide array of forms, though they usually can be placed somewhere on a continuum between large, monstrous birds and wholly anthropomorphized humanoids, the latter of which are often depicted with a red face and an unusually long nose. Early images of the tengu show them as kite-like beings that can take a human-like form, often retaining avian wings, head or beak. The tengu's long nose seems to have been conceived sometime in the fourteenth century, likely as a humanization of the original bird's bill. Indeed, the two depictions are seen as sufficiently discrete that each is referred to by a separate term, with "karasu tengu" (烏天狗) used to describe the avian tengu and "konoha tengu" (木の葉天狗) the humanoid form. In Japanese culture, a long nose signifies the alien, foreign, mysterious and sometimes frightening Other, who has foreign knowledge and superhuman power. … The Tengu-type portrait of Commodore Perry utilises such an image to represent the way Japanese perceived him (and the power behind him) at the end of the Edo era. Tengu are commonly depicted holding magical hauchiwa (羽団扇, hauchiwa) fans made of feathers. In folk tales, these fans sometimes have the ability to grow or shrink a person's nose, but usually they are attributed the power to stir up great winds. Various other strange accessories may be associated with tengu, such as a type of tall, one-toothed geta sandal often called tengu-geta. In addition to their frequent depictions in visual arts, tales of the tengu are common in both literature and folk tales (described below). The term tengu and the characters used to write it are borrowed from the name of a fierce demon from Chinese folklore called tiāngoǔ. Chinese literature assigns this creature a variety of descriptions, but most often it is a fierce and anthropophagous canine monster that resembles a shooting star or comet. In mythic accounts, they are described making noises like thunder and bringing war wherever they fall. Though a later account from the Shù Yì Jì (述異記, "A Collection of Bizarre Stories"), written in 1791, describes a dog-like tiāngoǔ with a sharp beak and an upright posture, usually the continental tiāngoǔ bear little resemblance to their Japanese counterparts. The 23rd chapter of the Nihon Shoki, written in 720, is generally held to contain the first recorded mention of tengu in Japan. In this account, a large shooting star appears and is identified by a Buddhist priest as a "heavenly dog," and much like the tiāngoǔ of China, the vision of this celestial body preceded (and was thought to presage) a military uprising. Although the Chinese characters for tengu are used in the text, accompanying phonetic furigana characters give the reading as amatsukitsune (heavenly fox). M.W. de Visser speculated that the early Japanese tengu may represent a conglomeration of two Chinese spirits: the tiāngoǔ and the fox spirits called huli jing. However, it is equally likely that that even this early occurrence represented a synthesis between the Chinese demon and the indigenous Japanese fox spirit (kitsune). The process by which the tengu was transformed from a dog-meteor into a bird-man is not entirely clear. Some Japanese scholars have supported the theory that the tengu's image derives from the Hindu eagle deity Garuda, who was pluralized in Buddhist scripture as one of the major races of non-human beings. Like the tengu, the garuda are often portrayed in a human-like form with wings and a bird's beak. Further, the name tengu seems to be written in place of garuda in a Japanese sutra called the Enmyō Jizō Kyō (延命地蔵経), but this was likely written in the Edo period, long after the tengu's image was established. At least one early story in the Konjaku Monogatari describes a tengu carrying off a dragon, which is reminiscent of the garuda's feud with the nāga serpents. In other respects, however, the tengu's original behavior differs markedly from that of the garuda, which is generally friendly towards Buddhism. 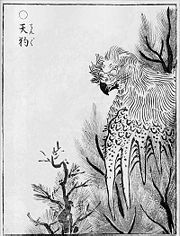 De Visser has speculated that the tengu may be descended from an ancient Shinto bird-demon which was syncretized with both the garuda and the tiāngoǔ when Buddhism arrived in Japan. Iga no Tsubone confronts the tormented spirit of Sasaki no Kiyotaka, by Yoshitoshi. 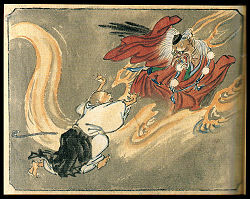 Sasaki's ghost appears with the wings and claws of a tengu. The Konjaku Monogatari, a collection of stories published sometime during the late Heian Period (ca. twelfth century C.E. ), contains some of the earliest tales of the tengu, already characterized as they would be for centuries to come. These creatures are the troublesome opponents of Buddhism, who rob temples, mislead the pious with false images of Buddha, carry off monks and drop them in remote places, possess women in an attempt to seduce holy men (or devout laity), and endow those who worship them with unholy power. They were often thought to disguise themselves as priests or nuns, but their true form seemed to be that of a kite (or other bird-like creature). From a theological perspective, the tengu were seen to be manifestations of ma (Sanskrit: mara), creatures of disorder and illusion whose sole purpose was to confound those on the quest for enlightenment. Intriguingly, though many of the tales and tropes described above created concrete spiritual opponents for Buddhism to define itself against, the image of the tengu was also be used to critique religious leaders, as in the Tenguzōshi Emaki (天狗草子絵巻, Tenguzōshi Emaki) (ca. 1296), which depicted the Buddhist elites themselves transforming into the winged demons (as discussed above). The tengu of this period were often conceived of as the ghosts the arrogant, and as a result the creatures have became strongly associated with vanity and pride. Today the Japanese expression tengu ni naru, literally, "he is turning into a tengu," is still used to describe a conceited person. In the Genpei Jōsuiki, written in the late Kamakura period (ca. 1300 C.E. 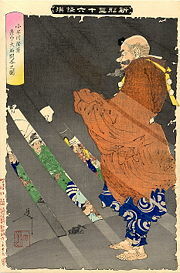 ), a god appears to Go-Shirakawa and gives a detailed account of tengu ghosts. He says that they fall onto the tengu road because, as Buddhists, they cannot go to Hell, yet as people with bad principles, they also cannot go to Heaven. He describes the appearance of different types of tengu: the ghosts of priests, nuns, ordinary men, and ordinary women, all of whom in life possessed excessive pride. The god introduces the notion that not all tengu are equal; knowledgeable men become daitengu (大天狗, big tengu, daitengu), but ignorant ones become kotengu (小天狗, small tengu, kotengu). The philosopher Hayashi Razan (1583–1657) lists the greatest of these daitengu as Sōjōbō of Kurama, Tarōbō of Atago, and Jirōbō of Hira. The demons of Kurama and Atago are among the most famous tengu. It is notable that, despite Razan's writing in the culturally-advanced Tokugawa period, it was still seen as entirely appropriate for an intelligent, government-employed Confucian scholar to write a credulous account of these spiritual beings. Daitengu are often pictured in a more human-like form than their underlings, and due to their long noses, they may also called hanatakatengu (鼻高天狗, tall-nosed tengu, hanatakatengu). Kotengu may conversely be depicted as more bird-like. They are sometimes called karasu-tengu (烏天狗, crow tengu, karasu-tengu), or koppa- orkonoha-tengu (木葉天狗, 木の葉天狗foliage tengu, koppa- orkonoha-tengu). Inoue Enryō described two kinds of tengu in his Tenguron: the great daitengu, and the small, bird-like konoha-tengu who live in Cryptomeria trees. The konoha-tengu are noted in a book from 1746 called the Shokoku Rijin Dan (諸国里人談, Shokoku Rijin Dan), as bird-like creatures with wings two meters across which were seen catching fish in the Ōi River, but this name rarely appears in literature otherwise. As suggested above, the singularly negative characterization of the tengu began to dissolve with the production of folktales and religious texts that described the origins and types of these beings. The Shasekishū, a book of Buddhist parables from the Kamakura period (1185–1333 C.E. ), makes a point of distinguishing between good and bad tengu. The book explains that the former are in command of the latter and are the protectors, not opponents, of Buddhism. It also states that, although the flaw of pride or ambition had caused the tengu to fall onto the demon road, they remained the same basically good, dharma-abiding persons that they had been in life. The tengu's unpleasant image continued to erode in the seventeenth century. At this time, some stories emerged that presented them in a fairly positive light, protecting and blessing Buddhist institutions rather than menacing them or setting them on fire. According to a legend in the eighteenth-century Kaidan Toshiotoko (怪談登志男, Kaidan Toshiotoko), a tengu took the form of a yamabushi and faithfully served the abbot of a Zen monastery until the man guessed his attendant's true form. The tengu's wings and huge nose then reappeared. The tengu requested a piece of wisdom from his master and left, but he continued, unseen, to provide the monastery with miraculous aid. This trend of positive representations was further bolstered by Hirata Atsutane (平田篤胤) (1776-1843), a well-respected Japanese scholar who wrote Kokon yomiko, a treatise describing the supernatural world. An additional subset of this scholar's output (on supernatural issues) consisted of interviews with Torakichi, a young man who claimed to have been raised by the tengu on a remote mountain—conversations that were recorded in a text entitled Senkyo Ibun. Instead of harming the boy, the spirits were thought to have instructed him in various magical abilities and esoteric arts. Atsutane worked feverishly on this project and he recorded several large volumes devoted to the personal stories of thirty-four historical, eminent Buddhist priests [considered to be tengu]; however, there are also several sections of the work based on fantastic tales from popular sources. … This work was strongly influenced by Hayashi Razan’s Jinjako, and there are also more than a few instances of Atsutane parroting those earlier ideas; however, the fact is that he had a stronger belief in the existence of tengu than Razan. Yet, Atsutane’s belief in tengu was not very different from that of the common person of his day. In the eighteenth and nineteenth centuries, tengu came to be feared as the vigilant protectors of certain forests. In the Sanshu Kidan (三州奇談, Sanshu Kidan), a collection of strange stories first circulated in 1764, one finds the tale a man who wanders into a deep valley while gathering leaves, only to be faced with a sudden and ferocious hailstorm. A group of peasants later tell him that he was in the valley where the tengu live, and that anyone who takes a single leaf from that place will surely die. In the Sōzan Chomon Kishū (想山著聞奇集, Sōzan Chomon Kishū), written in 1849, the author describes the customs of the wood-cutters of Mino Province, who used a sort of rice cake called kuhin-mochi to placate the tengu, who would otherwise perpetrate all sorts of mischief. In other provinces a special kind of fish called okoze was offered to the tengu by woodsmen and hunters, in exchange for a successful day's work. The people of Ishikawa Prefecture have until recently believed that the tengu loathe mackerel, and have used this fish as a charm against kidnappings and hauntings by the mischievous spirits. In addition to their role as guardians or protectors of nature, tengu are worshipped as beneficial kami (gods or revered spirits) in various Japanese religious cults. For example, the tengu named Saburō of (Mt.) Izuna is worshipped on that mountain and various others as Izuna Gongen (飯綱権現, incarnation of Izuna, Izuna Gongen), one of the primary deities in the Izuna Shugen cult. Izuna Gongen is depicted as a beaked, winged figure with snakes wrapped around his limbs, surrounded by a halo of flame, riding on the back of a fox and brandishing a sword. Worshippers of tengu on other sacred mountains have adopted similar images for their deities, such as Sanjakubō (三尺坊, Sanjakubō) or Akiba Gongen (秋葉権現, Akiba Gongen) of Akiba and Dōryō Gongen (道了権現, Dōryō Gongen) of Saijō-ji Temple in Odawara. In another tengu-centered religious practice, participants in the akutai matsuri (cursing festival) at Ibaragi prefecture begin by hurling insults at each other, in preparation for a contest of abuse with a priest dressed as a tengu at Mt. Atago's mountaintop shrine. "If one wins this exchange, it is believed that they will receive good fortune in the coming year." The folk hero Kintarō upsets a nest of small tengu. "The Tengu's Magic Cloak" (天狗の隠れみの, Tengu no Kakuremino): A boy looks through an ordinary piece of bamboo and pretends he can see distant places. A tengu, overwhelmed by curiosity, offers to trade it for a magic straw cloak that renders the wearer invisible. Having duped the tengu, the boy continues his mischief while wearing the cloak. "The Old Man's Lump Removed" (瘤取り爺さん, Kobu-tori Jiisan): An old man has a lump or tumor on his face. In the mountains he encounters a band of tengu making merry and joins their dancing. He pleases them so much that they take the lump off his face, thinking that he will want it back and join them the next night. An unpleasant neighbor, who also has a lump, hears of the old man's good fortune and attempts to repeat it. The tengu, however, simply give him the first lump in addition to his own, either to keep their bargain, to punish the neighbor for his craftiness, or simply because they are disgusted by his poor dancing. "The Tengu's Fan" (天狗の羽団扇, Tengu no Hauchiwa) A scoundrel obtains a tengu's magic fan, which can shrink or grow noses. He secretly uses this item to grotesquely extend the nose of a rich man's daughter, and then shrinks it again in exchange for her hand in marriage. Later he accidentally fans himself while he dozes, and his nose grows so long it reaches heaven, resulting in painful misfortune for him. "The Tengu's Gourd" (天狗の瓢箪, "Tengu no Hyōtan"): A gambler meets a tengu, who asks him what he is most frightened of. The gambler lies, claiming that he is terrified of gold. When the human asks the same question, the tengu truthfully answers that he is frightened of thorny plants (or some other mundane item). Following this exchange, the human assaults the unwitting being with the item that it fears most. In retaliation, the tengu, believing that he is playing a cruel trick, causes money to rain down on the gambler, who is, over course, overjoyed. A tengu bothers a woodcutter, showing off his supernatural abilities by guessing everything the man is thinking. Trying to ignore the bothersome spirit, the woodcutter returns to work, and resumes chopping wood. With one swing of his axe, he splits a log asunder, causing a splinter of wood to fly off and hit the tengu on the nose. The shocked spirit immediately flees in terror, exclaiming that humans are dangerous creatures who can do things without thinking about them. In addition to their frequent presence in Japanese folklore, the tengu were also frequently featured in classical literature. 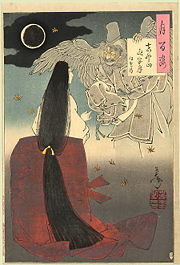 Specifically, stories of the supernatural (including kami, ghosts, demons, and, of course, the tengu) became increasingly popular throughout Japanese history, until, during the Edo Period (1600-1867), they became recognized as a discrete literary literary form, the kaidan-shu ("tales of the strange and mysterious"). In fact, the composition and recitation of these tales was a popular activity for all classes during this period. These supernatural topics have remained frequent subjects of Japanese art and literature up to the present day. Profoundly entrenched in the Japanese imagination for centuries, tengu continue to be popular subjects in modern fiction, both in Japan and (increasingly) in other countries. They often appear among the many characters and creatures featured in Japanese cinema, animation, comics, and video games. ↑ see Stephen Addiss (ed. ), Japanese Ghosts & Demons: art of the supernatural. (New York: G. Braziller, Lawrence: Spencer Museum of Art, University of Kansas, 1985). ISBN 0807611255 for more artistic representations of tengu. ↑ M. W. de Visser, "The Tengu." Transactions of the Asiatic Society of Japan 34 (2)(1908): 61. The specific avian species that they appear to have derived from is the tobi or tonbi (鳶), the Japanese black-eared kite (Milvus migrans lineatus). ↑ Mark Schumacher, "Tengu, the Slayer of Vanity" A-Z Dictionary of Japanese Buddhist Sculpture. Retrieved June 16, 2007. ↑ Pat Fister, "Tengu, the Mountain Goblin." Japanese Ghosts and Demons, ed. Stephen Addiss. (New York: George Braziller, Inc., 1985 ISBN 0807611263), 105. See images from this scroll here. Nezu. Retrieved June 14, 2008. ↑ Fister, 103. For images of the yamabushi's costume look here. (in Japanese) Retrieved June 14, 2008. ↑ Eldad Nakar, "Nosing Around: Visual representation of the Other in Japanese society." Anthropological Forum 13 (1)(2003): 61. Indeed, many early images of Europeans (especially of the early Portuguese traders who visited Japan's shores) depict them with the characteristic phallic noses of the tengu. ↑ For an extended discussion of this class of mystical artifacts, see U. A. Casal's "The Lore of the Japanese Fan," Monumenta Nipponica 16 (1/2) (April 1960): 53-117. He notes that the emblem of the Tengu King is "a feather-fan of flaming outline" (58 ff. 5). ↑ Shigeru Mizuki. Mizuki Shigeru No Nihon Yōkai Meguri. (Japan: JTB, 2001. ISBN 4533039561), 122. ↑ For a discussion of the indigeneity of Japanese fox spirits, see: D. C. Holtom, "The Meaning of Kami. Chapter II. Interpretations by Japanese Writers." Monumenta Nipponica 3 (2)(July 1940): 399. ↑ Schumacher, "Tengu, Slayer of Vanity" A to Z Photo Directory of Japanese Buddhist Statuary. Accessed June 16, 2007. ↑ de Visser, 87-90. Though this is a compelling hypothesis, he found little direct evidence to support it. ↑ Mills describes one case where a tengu disguises itself as Amida Buddha, D. E. Mills, "Medieval Japanese Tales: Part I." Folklore 83 (4) (1972): 294. ↑ One such tale is summarized in Carmen Blacker, "The Divine Boy in Japanese Buddhism." Asian Folklore Studies 22 (1963): 77-88, where the monk (who is occupied in transcribing the Lotus Sutra) is kidnapped and taunted with foreign (and no doubt malignant) wine and fish, 79. For a more general (and thorough) introduction to the medieval tales of spirit abduction (not all of which are directed at religious figures, please consult the entirety of Blacker's 1967 article "Supernatural Abductions in Japanese Folklore." Asian Folklore Studies 26 (2). ↑ Indeed, any "non-passive" female sexuality was seen (in patriarchal Japanese society) as being somehow dangerous and alien. This leads to an entire genre of literature concerning women possessed by the spirit of the tengu, who then attempt to mislead pious men using their physical assets. See Hitoro Tonomura, "Black Hair and Red Trousers: Gendering the Flesh in Medieval Japan." The American Historical Review 99 (1) (1994): 147. ↑ Haruko Wakabayashi, "From Conqueror of Evil to Devil King: Ryogen and Notions of Ma in Medieval Japanese Buddhism." Monumenta Nipponica 54 (4)(Winter 1999): 481-482, 491-493. ↑ The text accompanying these scrolls states that "these [priests of major temples] all dwell in ego-attachment, harbor arrogance, and consider fame and profit an important matter. For this reason, they will all without fail fall into the realm of ma (Mara)." Wakabayashi, 493. ↑ See Wakabayashi, 491-492 and passim, for a description of this process. ↑ de Visser, 45-47. This tengu-ghost eventually appeared and admitted to riding on the emperor's back with his wings clasped over the man's eyes. ↑ Wilburn Hansen, "The Medium is the Message: Hirata Atsutane's Ethnography of the World Beyond." History of Religions 45 (2006): 354. ↑ de Visser, 82; most kanji and some name corrections retrieved from here. ↑ de Visser, 84; Mizuki. Mujara 1: Kantō, Hokkaidō, Okinawa-hen. (Japan: Soft Garage, 2003), 70. The term konoha-tengu is often mentioned in English texts as a synonym for daitengu, but this appears to be a widely-repeated mistake which is not corroborated by Japanese-language sources. ↑ Described at length in Blacker (1967), 124-146. ↑ Haga, quoted in Hansen, 354. ↑ de Visser, 76-79. The okoze fish is known to science as Anema inerme, the mottled stargazer. Chūō Daigaku Minzoku Kenkyūkai (Chuo University Folklore Research Society), 1986: .Retrieved June 14, 2008. ↑ de Visser, "The Fox and the Badger in Japanese Folklore." Transactions of the Asiatic Society of Japan 36 (3) (1908): 107–109. See also: Encyclopedia of Shinto: Izuna Gongen and Encyclopedia of Shinto: Akiha Shinkō, and Saijoji, a.k.a. Doryo-son.Retrieved June 14, 2008. ↑ Mogi Sakae, [http://eos.kokugakuin.ac.jp/modules/xwords/entry.php?entryID=701 Encyclopedia of Shinto, Akutai matsuri]. Retrieved June 16, 2007. ↑ Keigo Seki, "Types of Japanese Folktales." Asian Folklore Studies 25 (1966): 170 (Asian Folklore Studies, Nanzan University). Online version here. japan.org. Retrieved June 14, 2008. ↑ Seki, 128-129. Online version here. (in English and Japanese) Retrieved June 14, 2008.Oni often take the place of the tengu in this story. ↑ Seki 171. A version of this story has been popularized for children in English by Tony Johnston as The Badger and the Magic Fan. ↑ Seki 172. Online version here. Retrieved June 14, 2008. ↑ Seki 54. This story often involves other mountain spirits, such as the yama-uba. ↑ This historical development of this genre is discussed in detail in Noriko T. Reider's "The Emergence of 'Kaidan-shū': The Collection of Tales of the Strange and Mysterious in the Edo Period," Asian Folklore Studies Vol. 60(1) (2001), 79-99. ↑ See Noriko T. Reider, "The Appeal of "Kaidan," Tales of the Strange," Asian Folklore Studies, Vol. 59(2) (2000), 265-283. Addiss, Stephen, (ed. ), Japanese Ghosts & Demons: art of the supernatural. New York: G. Braziller, Lawrence: Spencer Museum of Art, University of Kansas, 1985. ISBN 0807611255. Casal, U. A. "The Lore of the Japanese Fan," Monumenta Nipponica 16 (1/2) (April 1960): 53-117. He notes that the emblem of the Tengu King is "a feather-fan of flaming outline" (58 ff. 5). de Visser, M. W. "The Fox and the Badger in Japanese Folklore." Transactions of the Asiatic Society of Japan 36 (3) (1908): 107-116 Z. P. Maruya & Co.
Moriarty, Elizabeth. "The Communitarian Aspect of Shinto Matsuri." Asian Folklore Studies 31 (2)(1972): 91-140 Asian Folklore Studies, Nanzan University. Reider, Noriko T. "The Emergence of 'Kaidan-shū': The Collection of Tales of the Strange and Mysterious in the Edo Period," Asian Folklore Studies 60(1) (2001): 79-99. Schumacher, Mark, "Tengu, the Slayer of Vanity" A-Z Dictionary of Japanese Buddhist Sculpture. Retrieved June 16, 2007. Seki, Keigo. "Types of Japanese Folktales." Asian Folklore Studies 25 (1966): 1-220 Asian Folklore Studies, Nanzan University. The Tengu by M. W. de Visser, courtesy of Google Books. This page was last modified on 19 November 2015, at 15:30.